I've been doing some work with several clients recently to produce exhibitions with a "green" theme. In the course of some of my research one of the interesting green gizmos I've come across is the EnerJar. 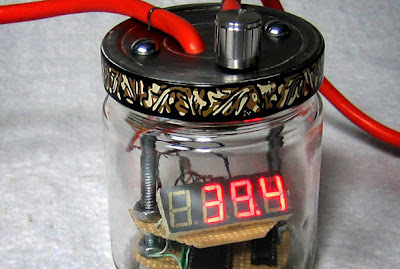 Basically the EnerJar is a device that accurately measures the power draw of electrical appliances. EnerJars would make a great project for museums to have their visitors build to take home, as well. It's a little scary to see how much energy all the "stuff" in a typical home uses! The EnerJar was the Grand Prize Winner in the 2008 Greener Gadgets Design Competition.Check out their website for a great collection of inspiring green technology ideas. What are some of your favorite green resources? Let us know in the comments section!